Nigel Owens (born 18 June 1971) is a Welsh international rugby union referee. He is the current world record holder for most test matches refereed and one of three professional referees at the Welsh Rugby Union, alongside Ben Whitehouse and Craig Evans. Owens started refereeing in 1987, after his sports teacher John Beynon suggested he take up refereeing after a school game. His first game was an under-15s match between Carmarthen and Pembrokeshire at the age of 16. Owens made his European debut during the 2000–01 European Challenge Cup season, refereeing London Irish and Piacenza on 21 January 2001. 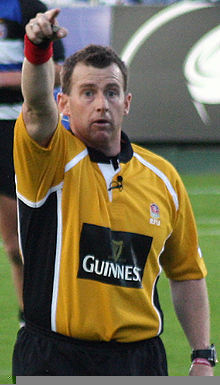 In October 2001, Owens was one of the first three Welsh Rugby Union professional referees. He made his debut in Europe’s Heineken Cup, refereeing Calvisano and Perpignan, on 12 January 2002. Owens made his Celtic League debut on 30 August 2002, refereeing Border Reivers and Connacht. Outside of Rugby Owens is also known as a TV personality, as one of the presenters of the S4C Welsh language chat shows Jonathan and Bwrw’r Bar (“Hit the Bar”).Owens also hosts his own quiz programme Munud i Fynd (A Minute to Go”). This entry was posted in All the Nigels. Bookmark the permalink.